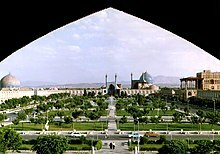 Isfahan (Persian: اصفهان, also known as Esfahan) is a city in central Iran, south of Tehran and is the capital of Isfahan Province. The Persians call it Nesf-e Jahan, meaning "Half of The World". Due to its beautiful hand-painted tiling and magnificent public square, it is considered to be one of the most beautiful cities in the world. An ancient town and capital of Persia from 1598 to 1722, it was long noted for its fine carpets and silver filigree. Today, textile and steel mills take their place. Its architecture, tree-lined boulevards and relaxed pace make it one of the highlights of Iran. The city is 430 km south of Tehran at the foothills of the Zagros mountain range. The city enjoys a temperate climate and regular seasons. Isfahan is located on the main north-south and east-west routes crossing Iran. Much of the splendor of the city, including most of its finest monuments, date back to the Safavid era, when the city was the imperial capital of Iran. The city has an Armenian quarter called New Jolfa established by Shah Abbas I in the 1600s. The district is named after the town of Julfa, still existing along the Aras river, from where Armenians were forcefully relocated during the development of Isfahan. They were allocated land south of the Zayandeh river, and built a prosperous community thanks to international trade networks. Today the quarter still has many Armenian churches and institutions. There are daily flights to Tehran and Mashhad in Iran. There are also flights to Dubai, Kuwait and Istanbul. Getting there: From the airport taxi costs 350,000 rials to the city centre (as of 2016). Besides, there are direct buses to Tehran's Imam Khomeini International Airport leave from Terminal-e Kaveh at 13:00, 18:00, 20:30 (and possibly other times as well). A trip costs 275,000 rials and takes under 6 hours (as of Sep 2016). There is a night-train to Tehran and a daily train to Mashhad. There are no trains to Shiraz. The night train from Tehran to Isfahan costs 240,000 rials for sleeping in a comfortable 6-bed compartment. Getting there: take bus #37 from the train station to Soffe Bus Terminal (ترمینال صفه;), where you can change for bus #91 to old town. The best place to get off is Chaharbaq street, where there are many hostels, hotels, cafés and things to see. Isfahan is well-served by highways. There are good routes to the capital Tehran, Kashan, Shiraz, Yazd and Ahvaz. Isfahan is well connected to most parts of Iran by bus. There are several bus terminals in Isfahan and you should note which one is more suitable for you. Royal Safar Iranian is one a few luxury bus operators. Seats are extremely comfortable with lots of leg room. Water and snacks are provided and movies are shown. The ticket to Tehran costs 300,000 rials, and takes around 5 hours. The easiest and the cheapest way of traveling inside of Isfahan is buying Isfahan card which is a multi-journey contactless card sold at certain bus stop booths. A single journey costs 5,000 rials when using Isfahan card or 10,000 rials if paid directly to a bus driver (as of 2017). There are separate sections in a bus: front - for men and rear - for women. Short rides cost 50,000 rials, longer ones to Soffeh mountain and bus terminals - 100,000 rials (as of 2007). Taxi drivers will try to demand at least double of those prices at the beginning. The stunning mosques of Isfahan are among the most beautiful and interesting in the world. 32.66308451.68160112 moshir (house of moshir almolk), harunia st,moshir st,hatef st,isfahan, ☎ +98 31 32223230, toll-free: +98 9131109181, e-mail: info@islamic-museum.com. 8:00-16:00. Built in Safavid era, Moshir al-Molk Palace is a historical European-style building. The first owners of the house were the family of Moshir al-Molk who were the Mostofis (finance ministers) and Monshis (secretaries) of Safavid court. Mirza Habib Allah Moshir al-Molk Ansari can be referred to as the most prominent figure in his family. He was assigned as the governor of Isfahan in Qajar era in 1288 AH (1841 AD). With the death of Moshir al-Molk, the house turned into the consulate of Kingdom of Prussia. Later, it was purchased by Haj Hossein Charmi, an Isfahani businessman. Haj Mohamad Samaeian was the next owner of the building. Madreseye Madar Shah (Imam Jafar Sadegh after revolution). The compound was built during Soltan Hossein, a Safavid king, to serve as a theological and clerical school to train those who were interested in such sciences.The dome and the greater part of the walls are covered in bright yellow bricks which give a feeling of lightness. The entrance gate decorated with gold façade and silver, and the tile-works inside the building are masterpieces of fine art and industry. The central court, with its pool and garden, are surrounded by arcades on two levels, each giving access to a student's room. Walk along the Zayanderud River beside the ancient bridges. You see many locals doing this everyday. However, as a result of a drought and badly planned dam, there is usually no water in the river. Jolfa - The Armenian Quarter, it includes one of the most beautiful churches in Iran. 32.6363851.65783419 Bedkhem Armenian Church (Bethlehem Armenian Church) (One building west from intersection of Nazar Str. and Tohid Str.). Another interesting combination of Persian and Armenian religious architecture, this large church completed in 1627 is full of stunning paintings and frescoes. Behind Jolfa Square, less than 5 minute walk from Vank Cathedral. 50,000 rials. 32.63969151.69649220 Flowers Garden (باغ گلها) (East of Bozorgmehr Bridge.). Botanical garden. 100,000 rials. 32.64047751.61121921 Birds Garden (باغ پرندگان) (1 km north west of Zayanderud Bus Terminal.). Garden under a huge net with a lot of different birds, some locked in and some that you can walk among. 180,000 rials. Buqe'h-ye Ibn-Sina (Avicenna's Dome) - 12th century. The Tombs of Nizam al-Mulk & Malek Shah - 12th & 18th century. Sheikh Bahai Bathhouse - falling apart due to neglect. Pigeon Towers - Built in the 17th century to attract pigeons, whose feces were then used as fertilizer. Shops in the main square must pay an additional 8% tax on sales, which is passed on to the customer. Unless the item that you are purchasing is unique or inexpensive, you may be better off shopping outside of the main square. For a real treasure trove, visit the famous bazaar. Isfahan carpets are world-famous, being the very finest of the Persian carpets. They are also often extremely expensive. Carpets from the nearby town of Na'in are similar in style, also well-known, and are expensive too. For those who are interested, it is possible to buy the highly decorative and brightly coloured traditional dress of Isfahan, but such clothing can be expensive, so it's better to haggle for a reasonable price. Miniatures These exquisite miniature paintings are painted on camel bone. Most of them are sold framed, and prices start from about 15,000 rials. It can be more costly if the artwork is done by a miniature master. Shop and look at various shops before making your decision. In some parks, you can simply obtain a carpet and tea from the park warden, and have a picnic on the grass! You will find families gather in these parks, and bring barbecues and cook freshly made kebabs, which smell (and taste) delicious. Chelo kebab (kebab with rice) is a must; there are regional variations in Isfahan. Beryani is a popular lunch dish in Isfahan. It has made with sheep meat and lung. Although Iranians love this meal, it is very fatty. Therefore some westerners may dislike Beryani. Fereni (a concoction of rice flour, water and milk) at Fereni Hafez, which is along Hafez Street near Imam Square. It costs 3,000 rials for a small bowl or 5,000 rials for a bigger one. Visit one of the tea-houses in the bazaar or under one of the bridges. There are lots of coffee shops in Isfahan. 32.6340451.671282 Hi Hostel, #2, No.16, Nobahar alley,near Mir bridge, N Sheikh Sadoogh St. (check HI Isfahan Hostel website), ☎ +98 913 603 9295, e-mail: info@hiesfahan.com. Check-in: 14, check-out: 12 but pretty flexible. HI Isfahan Hostel is a Comfortable, Clean and Affordable, budget hostel in Isfahan, budget accommodation, near the river, Jolfa (christian neighbourhood) and Vank Cathedral, 20-40 USD. 32.66488751.6824347 Dibai House, 1 Masjed Ali Alley, Harunie, ☎ +98 311 2209787, fax: +98 311 2209786, e-mail: info@dibaihouse.com. Dibai House comprises a fully and scrupulously restored 17th-century Safavid historic mansion that with modern facilities. No smoking indoors. Price includes breakfast, and owner Sufi is extremely helpful with travel information. €40/60/80 per room/night for single/double/triple rooms. 10% discount for stays longer than a week and for groups of 5 or more. 32.6518151.6760118 Hasht Behesht Apartment Hotel, Ostandari st, ☎ +98 311 221 486869, e-mail: hotel8behesht@yahoo.com. Clean, modern and central. 32.66821451.675519 Bekhradi Historial Residence, No. 56 Sonbolestan Alley, Ebn-e-Sina, Shohada Sq., ☎ +98 311 4482072-3, fax: +98 311 4882073, e-mail: info@safavidinn.com. Quiet, traditional khan-e-sonnati (Iranian traditional house). Five beautifully resorted Safavid-style rooms, some with bathrooms set around two garden courtyards. There is also a restaurant and free internet in this quiet area north of Imam Square. Rooms between US$60-90 per person, per night (+16% tax/service). 32.65063451.67115710 Safir Hotel, Amadegah Street (Across the street from the Abassi Hotel), ☎ +98 31 32222640, e-mail: info@safirhotel.ir. Glass elevator. Some rooms don't have windows. Includes a pool with massage services at USD50/hour. 32.65131651.6701911 Abbasi Hotel. Built during the reign of King Sultan Hossein of Safavids about 300 years ago. King Soltan Hossein attributed this magnificent complex of building to his mother. That is why it is called "the school and caravansaray of Madar-shah" (which means king's mother). The hotel also has a nice restaurant and tea house in the courtyard. 32.64253551.66555112 Kowsar International Hotel. Overlooks Zayandeh Rood River. 32.649351.6678513 Ali-Qapu Hotel, Chahar Bagh Ave, ☎ +98 311 2227922, fax: +98 311 2216049. 97 rooms and 4 suites. 32.64547851.65283814 Aseman Hotel. Overlooks the river. There are various Internet cafés in Isfahan. The best place which has the fastest connection and also cheapest in the city is the Central Library of Esfahan. 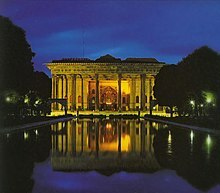 It is accessible from Naghshe-Jahan Square by five minutes walk. See the warnings at Iran#Stay safe. Dasht-e-Kavir (central desert of Iran) is easily reached by a 6-hour bus journey from Isfahan. You'll find oases, salt lakes, etc. Kashan is famous for its beautiful mansions from the 1800s and its gardens. Na’in is the first desert city toward east. It's a small and quiet town at the edge of desert. A perfect pattern of a desert town. Everything you like to see in a desert town you can find there. Qom is a holy city a few hundred kilometres away. Shiraz is around 6 hours south of Isfahan by bus. Toudeshk-Cho is 100 km from Isfahan, on the way to Yazd. It is a very, quaint traditional desert village and it is easy to get to from the Jey Minibus terminal. It is well-known among backpackers as the location of the Tak-Taku Homestay. This city travel guide to Isfahan is a usable article. It has information on how to get there and on restaurants and hotels. An adventurous person could use this article, but please feel free to improve it by editing the page. This travel guide page was last edited at 23:28, on 11 March 2019 by Wikivoyage user Ground Zero. Based on work by Wikivoyage users Ikan Kekek, Nelsonag96, Ibaman, Sina5884, Traveler100bot, Fatima.Jnj, ShakespeareFan00 and Matroc, Wikivoyage anonymous user 2A01:5EC0:B024:137C:14E8:496C:5539:8D78 and others.